I can't believe the film didn't do better in the box office. It's a buddy movie with action, humor and major Star Wars back story. What's not to love? Did I mention Chewbacca? The Blu-Ray is now available and I am confident that people are going to find their way to Solo and regret not seeing it sooner. 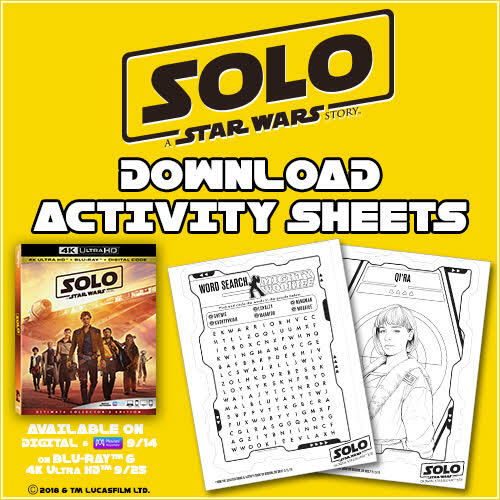 In celebration of the Blu-Ray and DVD release, check out this SOLO: A STAR WARS STORY ---> Activity Pack! It is filled with cool things for you and the kids to do together! “Solo: A Star Wars Story,” directed by Academy Award®–winning filmmaker Ron Howard took moviegoers on this summer’s wildest ride with the most beloved scoundrel in the galaxy, Han Solo (Alden Ehrenreich). 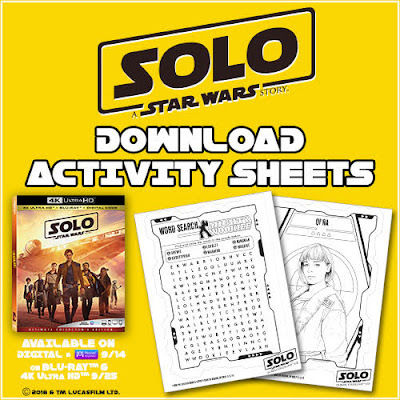 The action-packed journey explores Han’s first encounters with future friend and copilot Chewbacca (Joonas Suotamo) and notorious gambler Lando Calrissian (Donald Glover), as well as his adventure-filled past alongside fellow street thief Qi’ra (Emilia Clarke) and career criminal Beckett (Woody Harrelson). · The Millenium Falcon: From Page to Park – An exclusive look at the history of the most famous ship in the galaxy, its origin and development, and how it will translate in one of the most anticipated expansions in Disneyland’s history. I haven't seen this one yet! We started watching it the other day but had guests stop over so we stopped it and never got to finish! Its fun. We hope you finish it soon and you love it. As a Star Wars fan and Han Solo fan I was very nervous that this movie would be betray me. I was very happy with this movie and it is a wonderful addition! I highly recommend this movie! I am so glad that you agree! I am hoping to see more films in the series. I know they were supposed to do a Lando one bit with the light Box office on Solo have delayed that a bit. Hopefully it makes its way into production soon.